• Cashewnuts - 15 grams. • Mint - 40 grams. • Biryani masala - 1 bag. • Whole garam masala - 1 teaspoons. • Cauliflower - 100 grams. • Ginger garlic paste - 1 tablespoons. • Gr chilli sliced - 3 numbers. • Fried onions - 40 grams. • Paneer - 50 grams. • Carrots - 100 grams. • Potatoes - 100 grams. • Kala jeera - 1 teaspoons. • Rice - 300 grams. • Almonds - 15 grams. • Oil - 100 ml. • Curds - 200 grams. • Salt - 1 to taste. Take a pan add oil,garam masala, saute it add jeera, ginger garlic paste, vegetables cut a little bit long size mix well and add salt, need to cook till they are half cooked. Now add mint, coriander, green chillies, biryani masala mix half cup of curd, add paneer. Soak rice for 1 hr in abowl. Now boil water add rice to it, let the rice to be cooked half (70%) and strain the rice. Take a biryani bowl add half of the cooked vegetables spread all over the pan add some curd, nuts if required, salt, fry onions, add half rice, repeat the same process again. Lastly add fried onions, bread, close it with a lid, and cook it for 5 minutes on a very slow flame. Vegetable biryani is cooked with basmathi rice.A healthy and delicious biryani with vegetables and rice. Vegetable Biryani is a rich and exotic rice dish wit... Read More.. Vegetable Biryani is a rich and exotic rice dish with spicy vegetables. It is a popular Mughlai dish that has been adapted by the Indians. It’s special rice with exotic vegetables combined with dry fruits, spices, herbs and yoghurt to make it a rich dish. The aroma of saffron makes this dish very enticing and refreshing. 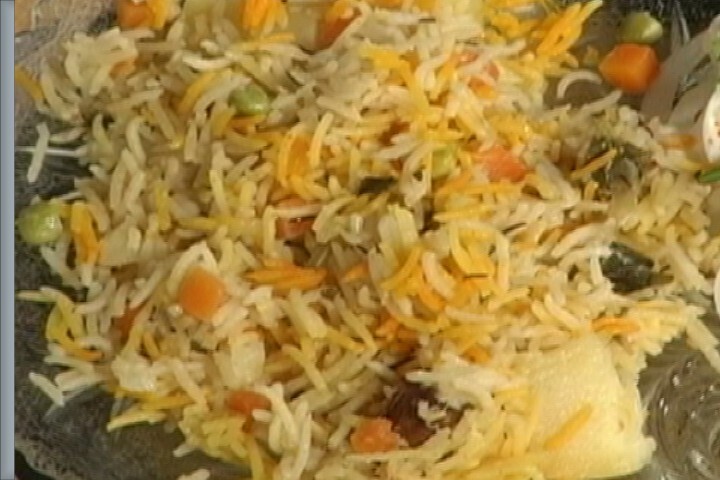 Vegetable Biryani makes a great dish for a formal dinner and can be served as main meal. Biryani, the thought of the name itself tingle the taste buds for its rich, flavorful, exotic, aromatic and traditional style of preparation. Vegetable biryani is one of the most luscious and tasty dish that if once eaten would crave for more. This dish is an all time favorite and always a dish which tastes great but at the same time great care is taken while cooking the rice and vegetables. Usually many get confused with a vegetable biryani and a vegetable pulao. The difference is easy and simple to know. When you make pulao, rice is cooked with vegetable and spices where as while cooking the Biryani, you cook the rice and vegetables separately and then both are cooked in an oven in dry heat. Thus the taste of a pulao and biryani makes a lot of difference. The vegetable biryani is very colorful by adding a variety of colorful vegetable like the carrot, beans, potatoes and peas which gives a great look for the biryani. Along with these the addition of saffron still enhances the flavors and gives a wonderful color and striking appearance to the exotic dish. It’s a very healthy and nutritious dish which can be a one pot meal dish having the whole bunch of vitamins and nutrients in it with the addition of vegetables like potatoes (carb, vitamins and minerals), carrots (pro-vitamin A, vitamins C, D, E, K, B1 and B6), Peas (B complex vitamins, vitamin C, vitamin A) and beans (good source of immune-supportive, vitamin A; heart-healthy dietary fiber, potassium, and folate; and energy-producing iron. In addition, green beans are a good source of bone-building magnesium, calcium, phosphorus, and copper; energy-producing thiamin, riboflavin, and niacin; muscle-enhancing protein; and anti-inflammatory omega-3 fatty acids). Not to forget curd which is also a important ingredient with enormous nutrition (contains measurable amounts of vitamins A, E and K; thiamine, riboflavin, niacin, pantothenic acid, vitamin B6, folate and vitamin B12. It also contains calcium, iron, magnesium, phosphorus, potassium, sodium, zinc, copper, manganese, fluoride and selenium, as well as saturated fats, and oleic acid, which is a monounsaturated fat). Biryani was introduced in India via Mughal cuisine.The word Biryani is derived from the Persian word beryā(n) which means "fried" or "roasted". Traditionally, biryani is layered in a heavy pot and heated through until the rice at the bottom becomes crispy, delicious and the flavor of all the spices penetrates into each and every grain of rice. It’s not very easy to cook biryani, as firstly it requires a whole lot of ingredients (each and every small ingredients is important for the flavor it gives) and takes time to cook, but the final result is truly heavenly and awesome. There are various types of aromatic biryanis from the Mughlai cuisine like the chicken biryani, mutton biryani, shrimp prawn biryani and many more that makes their cuisine exceptional. Vegetable biryani is a delightful feast to all the vegetarians packed with zing of taste and punches their palates. To prepare this exotic dish, take a pan add oil, whole garam masala (cardamom, clove, cinnamon, bay leaves and shahi jeera). Saute them and add zeera, ginger garlic paste, all vegetables cut into bit long size, mix well and add salt according to taste. Cook till they are half cooked. Do not over cook them as they would become soft and will not taste good for the biryani. Now add fresh mint leaves, chopped coriander leaves, green chillies, biryani masala mix and half cup of curd. You can also add paneer if you desire to. Do try this luscious dish and enjoy the feast like the royals. 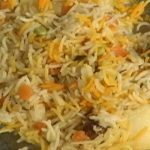 very nice article about Veg Biryani Rice Recipe with detailed explanation. I really appreciate your effort. How many people does this recipe serve? I'm assuming 4. Can I double the ingredients for 10 people? 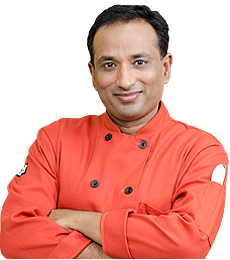 Sanjay Anna Jara koncham HD Videos tho update cheyyanna, so that we can enjoy your recipes with good clarity of each detail of recipe items and Recipe on big screens. Hi Vahchef! I made vegetable biryani for a Pot luck party and it was delicious!! Everyone loved it. I added chicken biryani masala along with all the khada masala. The best part is, the simplicity of the recipe..Thanks a lot!! thank you . I was did it today and I enjoyed a perfect lunch with my family? hi sanjay can you post how it is done south indian style. veg briyani you get in chennai? I tried your veg Biryani recipe and enjoyed. Thanks a lot. ?